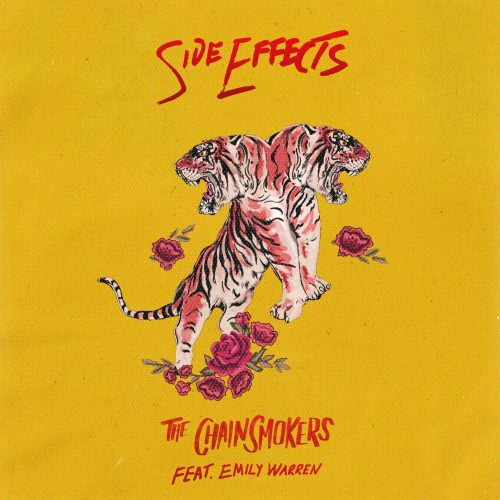 Grammy Award-winning artist/producer duo, The Chainsmokers, have released their new single “Side Effects” today via Disruptor Records / Columbia Records. The track, featuring vocals from longtime collaborator Emily Warren, is available everywhere HERE. Check out the lyric video HERE. Fans can expect the official music video, which will feature a special cameo from a recognizable actress, to drop in the coming weeks. “Side Effects” is the latest release from The Chainsmokers following a string of singles this year including “Somebody,” “Sick Boy,” “You Owe Me” and “Everybody Hates Me.” Together, the five tracks represent the latest chapter in The Chainsmokers’ ongoing building album, entitled Sick Boy. The duo continues to rack up an impressive list of nominations from various award shows, including nods from this year’s Teen Choice Awards, airing August 12 on FOX, and the 2018 MTV Video Music Awards, airing August 20 on MTV. These accolades follow nominations for many other major awards this year, including a Grammy Award nomination, six iHeartRadio Music Award nominations (with three wins) and six nominations at the Billboard Music Awards (with three wins). The Chainsmokers are set to perform “Side Effects” along with their other major hits on Good Morning America’s annual Summer Concert Series live from Central Park on August 10 on ABC. The duo are also set to perform “Sick Boy” for WE Day California, which will air August 17 on ABC at 8pm ET / 7pm CT. WE Day is a series of inspiring events that celebrate young people taking action on pressing social issues. Fans can catch Alex and Drew as they continue touring across the globe throughout the remainder of 2018. For a full list of shows, visit http://www.thechainsmokers.com/shows.